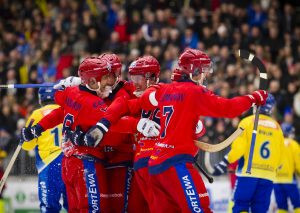 Russia are due to begin their quest to retain the Bandy World Championship title when they face hosts Sweden in the opening match of the Division A tournament in Vänersborg tomorrow. The Group A clash will be a repeat of last year’s final, which saw Russia beat defending champions Sweden 5-4 to claim a fifth title in six years. Also competing in Group A are Finland and Kazakhstan and they will face each other in tomorrow’s second game. Group B is made up of Germany, The Netherlands, Norway and the United States. Round-robin action in that section is due to begin on Sunday (January 27) with Norway going up against the US and The Netherlands doing battle with Germany. The top two in Group A will go directly through to the semi-finals on February 1, while the bottom two are scheduled to contest a play-off round against the top two in Group B on January 31. The winner of Group B will meet the fourth-place finisher in Group A, while the runner-up in Group B will play the third-place finisher in Group A. The majority of the matches at the event will be played at the Arena Vänersborg. The venue has a spectator capacity of 4,000. Slättbergshallen in Trollhättan will stage the fifth-place and seventh-place games.